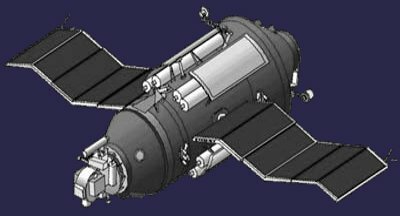 Cosmos-1686 also known asTKS-4, was a heavily modified TKS spacecraft which docked unmanned to the Soviet space station Salyut 7 as part of tests to attach scientific expansion modules to stations in Earth orbit. Cosmos-1686 NSSDC / COSPAR ID: 1985-086A NORAD ID: 16095. It was launched from Baiconur cosmodrom (USSR) and it was orbiting at altitudes 350 km (till November 1986) and 480 km (since December 1986). Cosmos1686 data collected from February to December 1986 is available. Instrument package ELECTRON-4 (developed in SINP MSU) onboard Cosmos-1686 is capable of measuring high energy electrons with energy >40 keV in 6 energy ranges and protons with energy >0.9 MeV in 3 energy ranges. The ELECTRON-4 instrument package onboard COSMOS-1686 satellite was created in D.V. Skobeltsin Institute of Nuclear Physics Moscow State University (SINP MSU). ELECTRON-4 consists of two simple instruments: ELECTRON-4A1 and ELECTRON-4A2. The instruments are oriented in two orthogonal directions. The orientation of COSMOS-1686 satellite is not fixed so the orientation of the detectors is undefined. ELECTRON-4A1 and ELECTRON-4A2 consist of a similar telescopes for observation of energetic charged particle spectra, and of similar packages of gas-discharge counters for observation of low energy particles. Each telescope consists of 4 axial semiconductor n-p detectors (n-p1, n-p2, n-p3 and n-p4 50mm, 2mm, 2mm and 2mm thick respectively) under aluminium passive shield (about 2.7 g/cm2 thick) with field of view about 20 degrees. The geometric factor of each telescope is 0.1 cm2×sr. The gas-discharge counter package consists of two gas-discharge counters (gdc1 and gdc2) under different passive shields (15 mg/cm2 and 1.1 mg/cm2, respectively). * this channel of telescope on ELECTRON-4A2 is not operating.